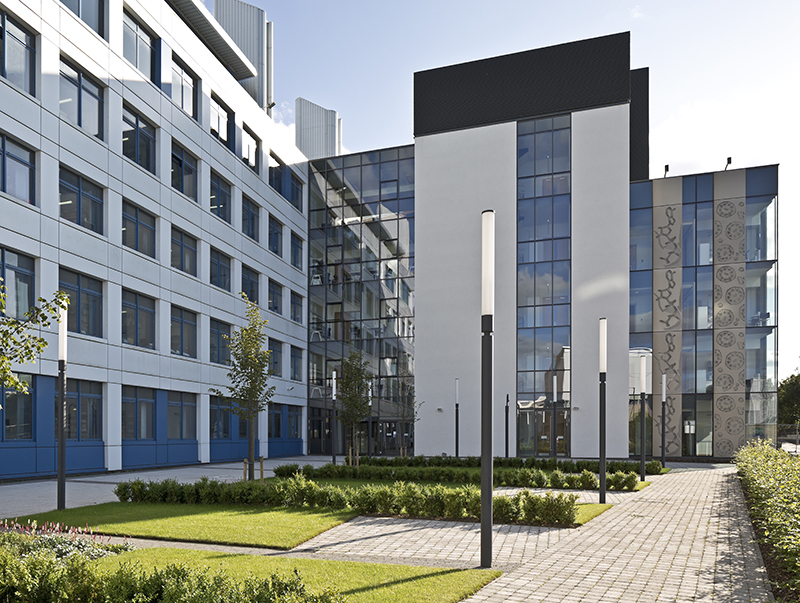 ‘Scales of Life’ was defined in 2013 as a major SciArt commission for the University of Dundee, College of Life Science’s new Centre for Translational & Interdisciplinary Research building. Elaine collaborated with the Regius Professor Michael Ferguson and the architect Jo White. 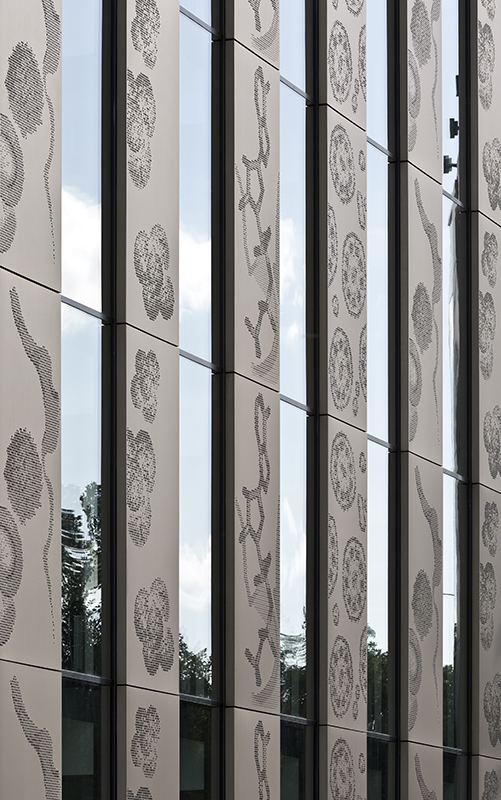 On three facades of the CTIR building, 16 columns of large metal cladding panels incorporate her artistic abstractions which represent the 4 key scales of life: Molecular, Organellar, Cellular and Tissue. The cladding panels (1.5m wide x 3.6m high) are made from a high quality anodised aluminium and are arranged vertically into groups of 4 panels. 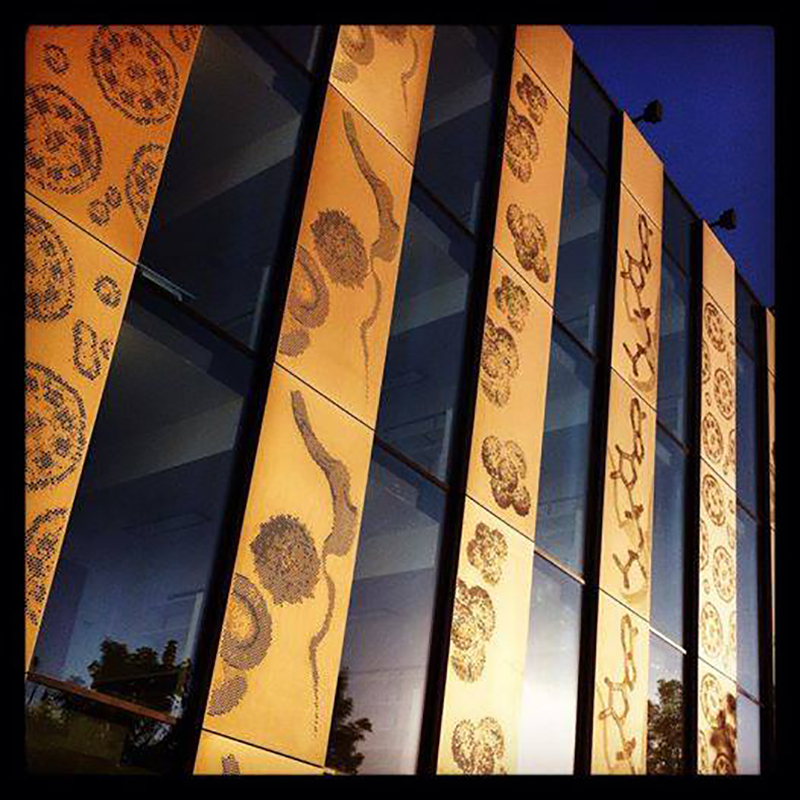 The panels address the essence of the four main scales of Life and the intangibility of their size and dimensions. The visual abstractions reflect both an interpretive aesthetic approach, and the need to retain scientific recognition and accuracy.The main objective of the work is that the series of images reflect in a meaningful way the scientific research being undertaken within the CTIR building. The Centre for Translational & Interdisciplinary Research (CTIR) was officially opened by Sir Paul Nurse on 01 October 2014. I was interested in whether a science-art fusion could ‘move the boundaries of visual interpretation’. I found the scientific images lent themselves to artistic exploration and interpretation. Could my particular visualisation really enable the production of works of art with high impact and resonance? What are the effects of artistic expression, communication and methodologies on our understanding of complex scientific discoveries? Architecturally, different materials and building techniques were considered in order to create ‘a breathable skin’ for the building which led to the adopted idea of using perforated custom-made anodised aluminium panels rather than solid etched or engraved surfaces. The scientific images were considered and reworked using a variety of traditional techniques and subsequently translated into the digital domain. Cardboard prototypes were made using a laser cutter to test that the images would be legible and appear three-dimensional. Too many perforations and the material would not be structurally sound, too few and the image would not be legible. 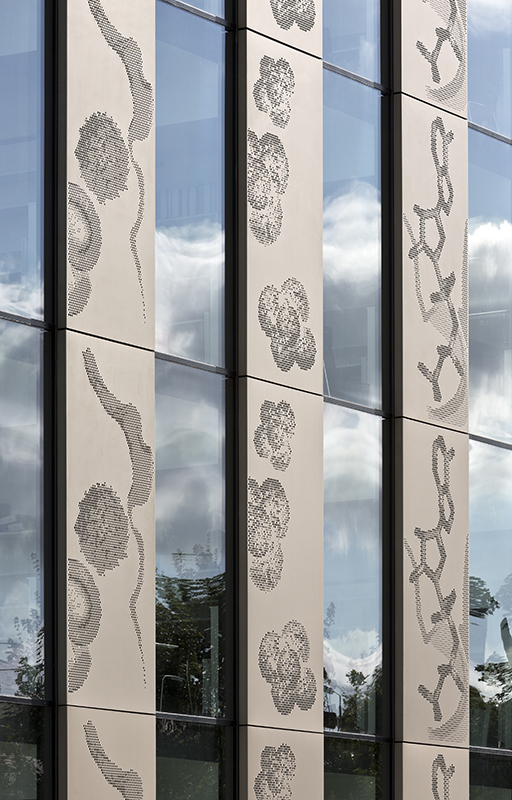 This artwork would be an integral part of the building and it had to embody the science within the visualisation. However, the restrictions imposed by perforations as a drawing tool posed a problem of how a low- resolution images could serve to convey some very profound scientific research and discoveries. This was perhaps, the greatest challenge of the project. By employing digital technology alongside traditional printmaking methods the different scale magnification in each source image was a reference to the different scales of life under scrutiny: molecules make up the organelles, which make up the cells, which make up the tissues. Shemilt, E. (2002). Artist’s Notes. In (eds), Shemilt E. Traces of Conflict. Imperial War Museum, London. Shemilt, E. (2009). A Blueprint for Bacterial Life; Can A Science-art Fusion Move the Boundaries of Visual and Audio Interpretation? In (eds), A. Bentkowska-Kafel, T. Cashen, H. Gardiner. Digital Visual Culture: Theory and Practice, Computers and the History of Art, Intellect, Bristol. 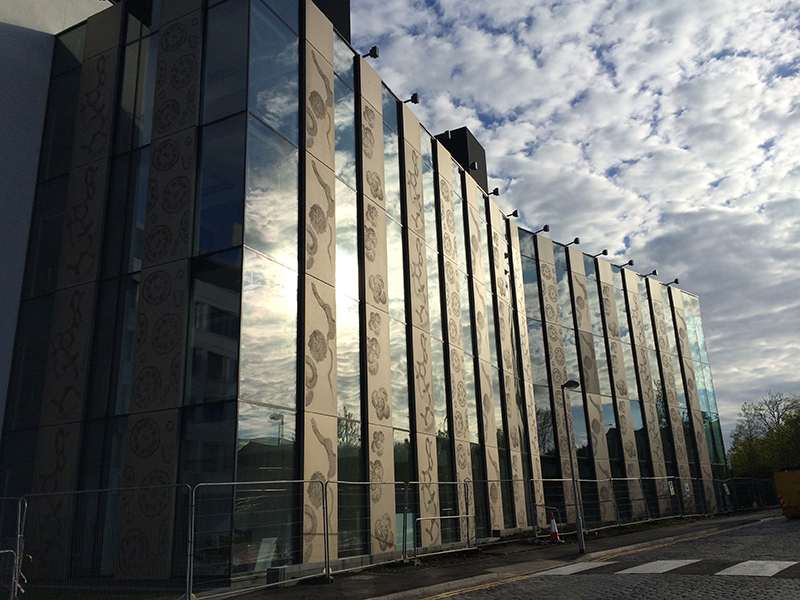 http://www.lifesci.dundee.ac.uk/discoverycentre (retrieved 21 June 2015).